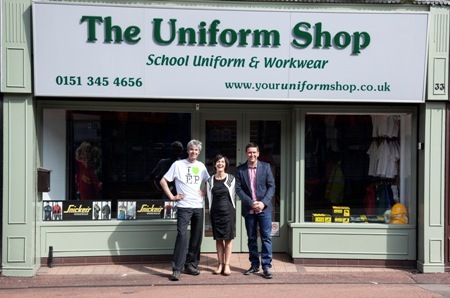 17 July 2013 The Uniform Shop – which provides school uniforms to pupils of all ages – has opened its doors on Ellesmere Port’s Whitby Road. And the shop is the first to take advantage of a new council improvement scheme for parts of Station Road and Whitby Road designed to improve the look of the town shops by offering grants for new signage. Town Centre Improvement Manager Jochem Hollestelle with The Uniform Shop owners, Mark and Vanessa Bond. The grant scheme also aims to modernise shop fronts, as part of a wider drive to improve the town centre and create a more positive perception. Executive Member for Growth and Prosperity, Councillor Herbert Manley, said: “With the current tough economic climate Whitby Road has many unused retail outlets and encouraging landlords and business owners to claim this grant will not only improve the appearance of one of the main routes into the town but will bring properties back into use. The Uniform Shop is a family run business serving families from Ellesmere Port and the surrounding area for school uniforms and work wear. Mark Bond, of the Uniform Shop, said: “We are very grateful for the Council’s grant – which has enabled us to order and install modern signage above our new shop. “We wanted a central location where families throughout Ellesmere Port could easily find us and Whitby Road seemed the perfect choice. Local member, Councillor Justin Madders, said: “Whitby Road has a considerable number of properties that have remained empty for a long time, something I know local residents would like to see change, so it’s great that new businesses are opening their doors.